We had planned to do a spring pasta with asparagus and pancetta, but, alas, our refrigerator was sensa asparagi. However, we had a batch of fresh green beans, just off the farm, so we went for the substitution. Success! This is one of those pastas that just works -- perfectly! The combination simply has wonderful overtones. Other pasta of the fusilli type works equally well. In fact, we did this one once with strozzapreti (the priest chokers). 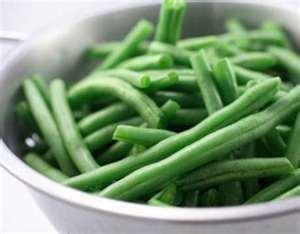 Chop off the ends of the green beans, then cut them in half-inch lengths. In a separate pot, parboil the green beans until al dente -- still crispy, and set aside. In a saute pan over medium heat, put in one tablespoon of the olive oil and then add the pancetta or bacon. Saute for four or fine minutes until the pieces are well browned, but not crisp. With a slotted spoon, remove the pancetta/bacon and put on a paper towel. Drain the oil from the pan and then add two tablespoons of fresh olive oil. Over medium heat, add the garlic, and twenty seconds later, add the onion. Cook the onion until it is translucent, about four minutes. Add the green beans and the pancetta/bacon, a half teaspoon of salt and some freshly ground pepper. Stir and cook for a minute or two. Meanwhile, bring 4-5 quarts of water to a boil. Add two tablespoons of salt. Drop in the pasta and stir. Continue cooking until al dente. Reserve a cup of the pasta cooking liquid. Drain. Combine the pasta with the sauce over a medium heat. Add the parmesan and the tablespoon of butter. Stir thoroughly. If it is not moist enough to coat evenly, add some of the reserved cooking liquid to get to the right consistency. Taste for salt and pepper. Put a cover on the saute pan and turn up the heat to high, for one minute. This gets the pasta steaming hot, as it should be! Serve with the parsley as a garnish, and extra pecorino/parmesan on the side.